Betty Shabazz was born Betty Dean Sanders, but her birthplace is unknown. She claimed it was in Detroit, Michigan, but records from the period seem to indicate that she had been born in Georgia. Her father abused her, and the state stepped in to take her from her home when she was 11 years old. Custody of young Betty was given to Lorenzo and Helen Malloy, who were prominent middle-class people. Lorenzo was a businessman, and Helen was a founding member of the Housewives League of Detroit. Sanders had a sheltered childhood under Lorenzo and Helen’s care, and she didn’t experience racism firsthand until 1942, when she witnessed two race riots that shaped her worldview heavily. She decided to go to school in Alabama, but nothing in her life could possibly prepare her for the level of racism she faced when she arrived at school there. Her parents, believing it was better to not talk about race, advised Betty to stay on campus and ignore the insults. She soon left that oppressive environment and travelled to Harlem. There, under the guidance of a friend, she began attending meetings to become a member of the nation of Islam. Her preacher was a charismatic young man named Malcolm X. Sanders and X cultivated a relationship over dinner parties and public events, eventually marrying in January of 1958. She became Betty Shabazz and gave him six daughters, while he gave her a strong sense of discipline and a supportive home. Her life changed forever in February of 1965. Her husband’s public appearances put him in danger, and a disturbance in front of the Organization of Afro-American Unity quickly turned into a shooting. Betty watched her husband Malcom get gunned down in front of her. 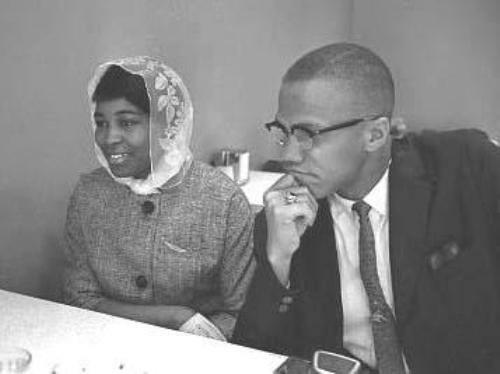 While she remained discouraged for a time after Malcom’s death, Shabazz eventually continued her philanthropic work encouraging the mixing of races. Shabazz died after her young grandson started a fire in her apartment. She was unable to recover from her injuries.